You did a wonderful job to arrange all of the logistics that we had planned. You made our vacation pleasant full of fond memories and not many frustrating times. Everything we discussed was as good or better than I could have imagined. With the exception of the hotel in (Florence) which was very accessible but very small and had no natural light. Even if we take away the negative aspects it had many positive issues that are not sometimes in hotels even in the US. Such as having the front door accessible and bathrooms accessible. I was very surprised to see how many "family" style restrooms there were since my wife has too assist me in the bathroom. All of the arrangements you had made you did an outstanding job. The drivers were courteous, prompt, all had clean vans and most importantly they knew what they were doing in operation of the lifts. The translators for the most part were very friendly and informative and most importantly knew all of the shortcuts to get into museums such as the Vatican. Even the trips you had planned for us to Lucca and Siena which were cities that we were not familiar with were always unexpected surprises. Of course, I'd assume you'd get this a lot, the Amalfi Coast was something out of a magazine! It was a long day but it was well worth it, the beautiful coastline was just breathtaking. The trip from Roma to Florence was a wonderful experience in itself. The villas all built on top of the hills and mountains were just so scenic it needed a very pleasant journey. We stopped at a winery/restaurant/hotel just outside of Florence which was marvelous and the food was exquisite my calamari was stuffed with shrimp and was delicious, the wine before dinner, during dinner and the grappa after dinner made things very pleasant. My wife said she had the "best steak of her life" for her meal. The weather did very well for us it only rained two days and of those two days the rain was not consistent he was just on and off. Pisa was cold but all of the other days were warm or hot. Frankly I like it hot but my wife does not so I guess we were both fairly satisfied with the weather. Off the top of my head I'm not sure what you could have done differently not knowing me. Working with people that have a disability there are always issues for one person that are not an issue for another. I consider myself very disabled when it comes to my needs but then again I do know people who have even more needs than myself -- everyone is different. The airlines were different story, by the time we got to New York they had already broken the side of my chair and lost a piece from my control on my electric wheelchair. They do not take care when they stow your wheelchair in the hold of the airplane. On the way back because we had left Florence 35 minutes late we missed our flight going to Boston and had to wait six or seven hours until the next flight to Boston. We finally arrived at 10 p.m. Sunday night. It was pleasant to hear you speak after all of these e-mails even though it was under somewhat stressed circumstances would you speak English very well. I would be more than happy to speak to any of your clients about our experiences with Regency. I can assure you will get five stars! Thank you again for all your help and can you tell me any other countries that you may arrange. Do you go outside of Italy? Or do you have other agencies that may work in other countries doing the same thing you do? If you do have any questions for me that I have not answered please feel free to contact me. Again, thank you so much for your detailed and intuitive planning, you're very good at doing what you do. I will enclose a photo just so you can see our faces with all our e-mails. 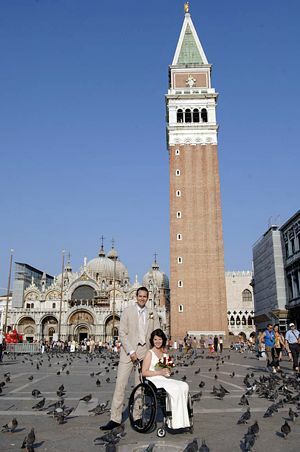 I knew that getting around Italy in a wheelchair would be challenging and we were already in touch with Laura at Accessible Italy when my now-husband and I decided that we would like to get married while we were there. We could not have pulled this off without Laura - she took care of everything! She walked us through all the steps to ensure it was legal including helping complete all of the paperwork and corresponding with the city of Venice and the Canadian Embassy in Rome on our behalf. Laura also arranged all of the services that we would need - transportation, translator, photographer, as well as flowers and a hair and make-up stylist that came to our hotel the day of the wedding. She also purchased train tickets (delivered to our hotel before our arrival along with keys for the stair lifts at various bridges throughout Venice) from Venice to Florence in advance - something our travel agent was not able to do. We knew very soon after we made contact with Laura that we could have every confidence in her ability to arrange our wedding and we didn't haven't to worry about a thing. She was very prompt in her responses and even attended to our business during her vacation - a clear demonstration of her commitment to ensuring everything was in place. Our wedding was a completely stress free and enjoyable event thanks expressly to Laura and staff at Regency/Accessible Italy. My name is Noel Helen Viviani and my mother Nancy and I went on a wonderful trip organised by Laura from Accessible Italy to Florence and Rome in May/June of this year. We are from Australia. My father is Italian and my mum is Australian and I was born here in Australia. I had been to Italy about 30 years ago with my whole family, but this time only Mum and I went. I am the one in the wheelchair. Italy was not as accessible then, as it is now. The trip was set out so that I could have one day rest before the tour started and one day rest before we came home. (I recommend this). Laura's firm was very helpful in setting up our bookings for both hotels,etc. We spent one week in Rome and one week in Florence with a day stop off in Kuala Lumpar on the way there and back. In Rome we stayed in a family run hotel called The Lancelot where we had all meals provided except for lunches. It is a comfortable hotel that is fully accessible for wheelchairs as it's entrance is on the ground floor and they have one room on the ground floor with a totally accessible bathroom with a roll in shower. The room was quite large, and the bathroom was small but manageable for one wheelchair. It had a roll in shower which was great. We had a driver with a minivan with an elevator at the back of it so I didn't have to transfer into a seat on the bus. We had the same travel arrangement in Florence. (Laura from Accessible Italy organised all this for us). We took a totally wheelchair accessible train from Rome to Florence. In Florence we stayed in a hotel called The Orto Dei Medici which is a lovely hotel within walking (or pushing)distance from The Uffizi Gallery. This hotel room was a bit smaller due to the fact there was a big wardrobe in the room, but again, the bathroom was completely accessible with a roll in shower, so that was great. The only meal they provided was breakfast, but there were heaps of great restaurants within walking distance. We went to The Vatican (in Rome of course)and had lots of different guides for both Rome and Florence so we weren't just wandering around ourselves. The guides Accessible Italy organised were wonderful, very informative and lots of fun. We went to lots of other places, and everywhere we went the guides would go in first to make sure it was all accessible for me. The Amalphi Coast is a must, it was beeeeeeeeeautiful the day we went. We paid for the trip by sending Money orders if I remember correctly instead of paying by Credit Card - this takes a little more time to fix up and can be quite stress making, but it turned out ok in the end. In conclusion, Mum and I had a wonderful time in Italy, the weather was great, not too hot. As I said earlier, we went end of May early June (for my birthday)and if I remember correctly, we only had one day rain, and we were in the Vatican museum, so it didn't matter. We are so inspired by these new accessible travel sites that are coming up on the web, we are planning to go to Germany next year to visit friends. I do hope this testimonial helps others decide to get Accessible Italy to organise a trip to Italy for you, as this is the best no stressful holiday my Mum and I have been on, thanks to Laura. 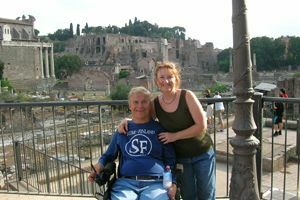 By the way, the picture attached to this email is a picture of me (in wheelchair)and our guide in Rome - we are standing outside the Coliseum.